Beautiful 2 bedroom/loft/3 bath in the Snowcreek V complex. Guests will climb the stairs to discover an open living space with lovely lodge decor. The living room area has a queen sleeper sofa, TV/DVD/VCR, large overstuffed furniture, and a gas fireplace with stone facing. 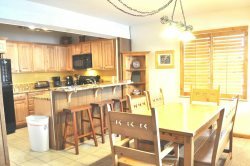 The adjacent deck is perfect for entertaining with a BBQ, a table with 4 chairs, and a view of the lovely Snowcreek grounds. The dining table seats 8 and the fully stocked kitchen accomodates 4 more guests with barstool seating. Guests will enjoy the master bedroom with the queen bed, TV/VCR, and attached master bath with his/her sinks. The second bedroom is perfect for the kids with a twin over full bunk that includes an extra twin mattress underneath, TV with VCR and comfortable chair for relaxing. There is also a second bath on the main level with an unit washer/dryer. Lest we forget the loft that hosts a queen bed with TV and attached full bath. This is the perfect space for a larger party!